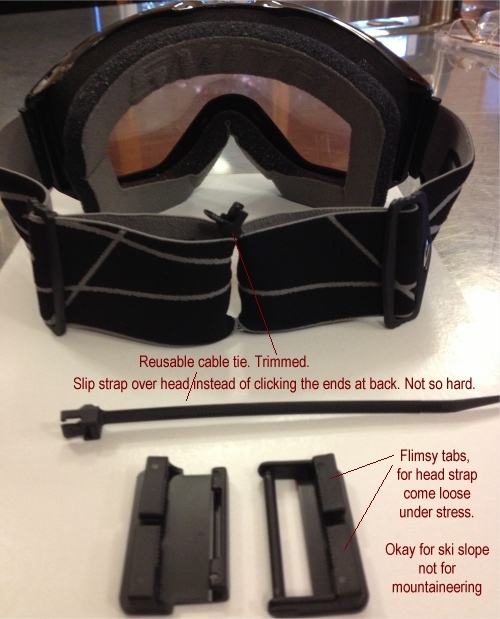 While adjusting the straps this afternoon, I found that even moderate stress on the goggle straps caused them to pull loose from the clasp/buckle pieces that allow it to be connected at the back of the head. Perhaps okay for the ski slopes, not for mountaineering. So I punted on the existing clasps and opted for a reusable cable tie. A normal one would work as well. So, I need to slip the strap over my head rather than buckling the ends. Not such a penalty for keeping the goggles from sailing off into the abyss.